Antonov Airlines has flown mining equipment from East Midlands Airport to Franceville Airport in Gabon in just nine days on AN-124-100 ‘Ruslan’ aircraft for Bolloré Logistics. 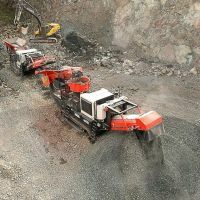 Ground staff in the UK used the carrier’s purpose-built ramp to load two tracked crushing machines weighing nearly 70 tonnes, and the entire process was completed using remote control. The airline also gained special permission to land in Franceville, which is 600km closer to the mine than the capital, Libreville.